Scenario #1 – The first scenario to be compared. Scenario #2 – The scenario to compare against Scenario #1. Save As Selection Sets: You can save selection sets based on the three analysis results. These can be used for later reference if you wish to make amendments based on these results. 3. Elements with different values: When comparing elements in either scenario, a value is found to differ. 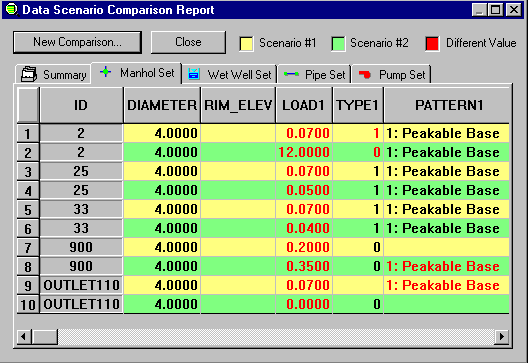 This may not be undesirable, but will serve to highlight specific data items, such as different pipe diameters or manhole loadings between the two scenarios, for checking purposes. Reset SS: Stands for Reset Selection Set. You may want to use a regular set of selection sets for Compare Data Scenarios. If this is the case, each time the Compare Scenario command is carried out, the existing selection set is cleared. Report Color: You can select how the elements will be displayed in Compare Scenario’s output report. This provides a quick way of comparing data between scenarios. Compare: When two scenarios have been specified, click the compare button to perform the comparison. Cancel: Cancel the compare operation. 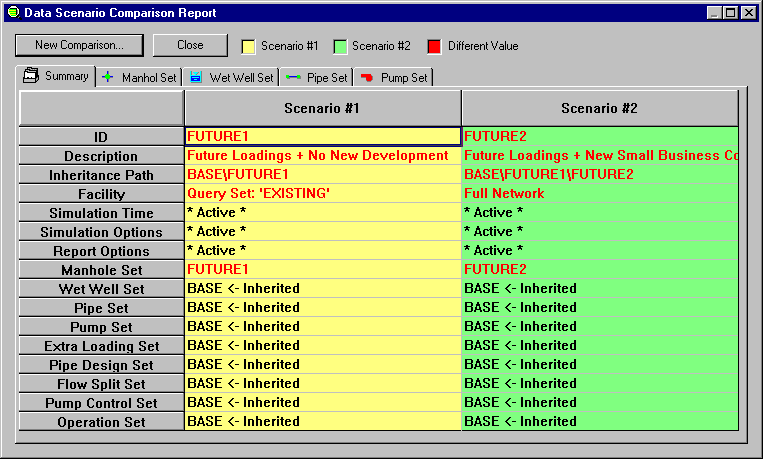 Once the Compare Data Scenarios dialog box appears, the user will see that the Active scenario (in this case, BASE) is selected. You can compare the Active scenario and another scenario in a model. Alternatively, you can select another scenarios other than the Active scenarios to compare to another scenario. 1. Select the first scenario you wish to compare from the Scenario #1 drop down list. 2. From the Scenario #2 drop down list, select the scenario you wish to compare to the first scenario. If you wish to save the location of any elements that have data flagged by the Compare Scenario feature, you can save selection sets to refer to at a later time (i.e. from the Domain Manager). For information on creating a selection set, refer to selection sets. 1. If you wish to save a Selection Set based on the elements that are in Scenario #1, but not in Scenario #2, check the Save elements that exist in Scenario #1 only option. 2. If you wish to save a Selection Set based on the elements that are in Scenario #1, but not in Scenario #2, check the Save elements that exist in Scenario #2 only option. 3. If you wish to save a Selection Set based on elements that differ between the two scenarios, check the Save elements that have different values option. Please note, you must have different selection sets selected for each comparison result that is to be reported. If you wish to reset an existing Selection Set, ensure that the Reset SS option is checked. To alter the colors selected for each of the Compare Scenario outputs, click on the color swatch you wish to change, and a color pick dialog will appear for you to select a new color. 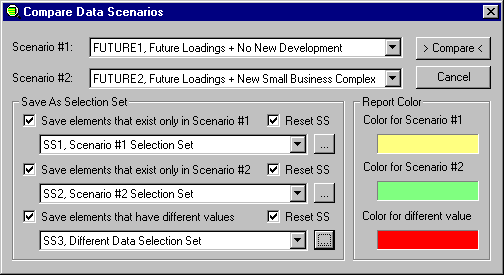 Each color that is selected in this dialog will be reflected in the Data Scenario Comparison Report legend. To conduct a comparison of scenarios, press the button. Compare Scenarios presents the results in a format that allows to readily compare each scenario’s data. When the comparison analysis is completed, you will be presented with a display similar to the Graph Reports. New Comparison: This button will re-open the Compare Scenarios dialog to enable the user to conduct another comparison of scenarios. · Inheritance Path – Shows each scenario’s inheritance (from each of it’s parent scenarios, and their respective parent scenario). For further explanation of inheritance, refer to Scenarios. · Facility – Describes how the scenario has been created, ie. With a query set, existing network, or Intelliselect. Refer to Facility Sets for further information. · Simulation Time, Simulation Options, Report Options – Settings made under the Run Manager. · Data Sets – Each data set that is found within a scenario, configuring what data appears within the scenario. Data Set Tabs: For each data set tab, data that is considered different between scenarios will be presented. To view the comparison results of the scenarios for each facility data set, click on a tab. In this first example, you can see that Scenario #2 has a manhole with ID 900 and a loading of 0.2 cfs (note the coloring of the row). In this next example, between scenario #2 and #3, the manhole with ID 900 has a loading in the first scenario of 0.2 cfs, but in the second scenario, it has a loading of 0.35 cfs.